Here at the Cyberbullying Research Center, we use data to better understand what teens are thinking, doing, and experiencing at school and online. We promote evidence-based and research-inspired policies, procedures, and programming. And given the frequently-changing nature of technology use and misuse, we find it necessary to collect our own data on a regular basis in an effort to keep up. We’ve now conducted twelve formal surveys of middle and high school students over the last fifteen years, that includes data from over 15,000 respondents. We’ve also surveyed parents, police officers, and educators, but most of our information comes directly from youth themselves. In each study, we learn a little more about what teens are confronting at school and online. We just completed our most ambitious study: a survey of a nationally-representative sample of 4,500 12-17 year-olds. As far as we know this is the largest national survey of students on these issues. We fielded the survey in August, and while it will be some time before the results are published in books or peer-reviewed journals, we wanted to release some preliminary data here today. In our study we informed students that “Bullying is when someone repeatedly threatens, harasses, mistreats, or makes fun of another person (on purpose) at school.” Based on this definition, 73% of students reported that they had been bullied at school some point in their lifetime (44% said it happened in the last 30 days). Among those who were bullied recently, 88% said they were called mean names or were made fun of in a hurtful way while 77% said they were excluded from groups or left out of things. One out of five told us that they had been threatened with a weapon at school. At the same time, 32% of the students admitted that they had bullied others at school at some point in their lifetime (12% said they bullied others within the previous 30 days). Most commonly, students who engaged in bullying said they called other students mean names (51%) or excluded them from things or groups (43%). Almost one-fifth (18%) acknowledged that they forced another student to do things he or she didn’t want to do. 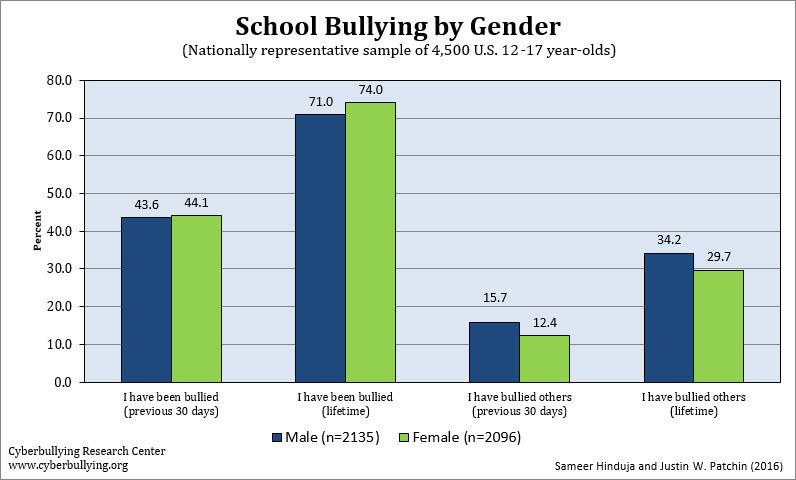 Girls were slightly more likely to have been bullied at school, while boys were more likely to have bullied others. With respect to online bullying, we instructed students that “Cyberbullying is when someone repeatedly threatens, harasses, mistreats, or makes fun of another person (on purpose) online or while using cell phones or other electronic devices.” Based on this definition, 34% of students had experienced cyberbullying in their lifetime (17% within the last 30 days). Four out of five of the students who were cyberbullied said mean comments were posted about them online, while 70% said someone spread rumors about them online. Notably, nearly two-thirds (64%) of the students who experienced cyberbullying stated that it really affected their ability to learn and feel safe at school. 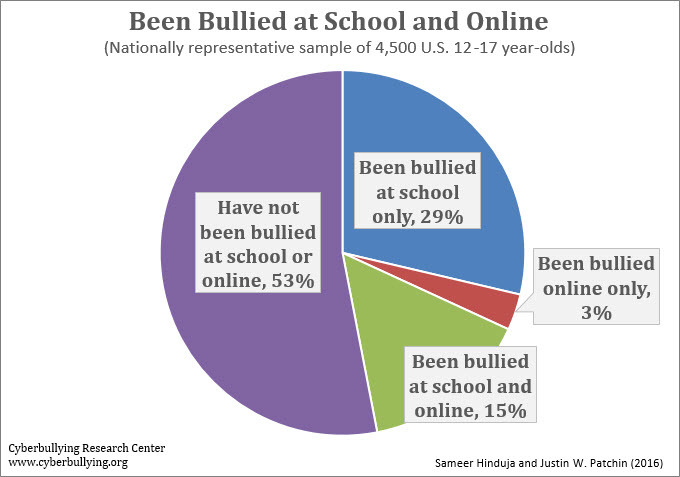 In addition, 12% of the students admitted that they had cyberbullied others at some point in their lifetime (6% in the previous 30 days). The most commonly reported behaviors included spreading rumors online (60%), posting mean comments online (58%), or threatening to hurt someone online (54%). 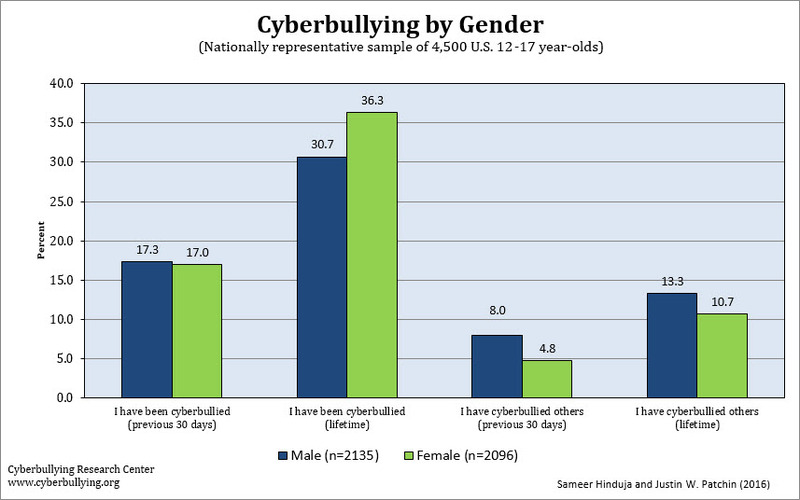 Girls were more likely to have been bullied online at some point in their lifetime (though when looking at recent experiences there was no difference), while boys were more likely to have bullied others online. It has long been known that there is significant overlap between school and online bullying. We observed this again in our most recent dataset. For example, 83% of the students who had been cyberbullied recently (in the last 30 days), had also been bullied at school recently. 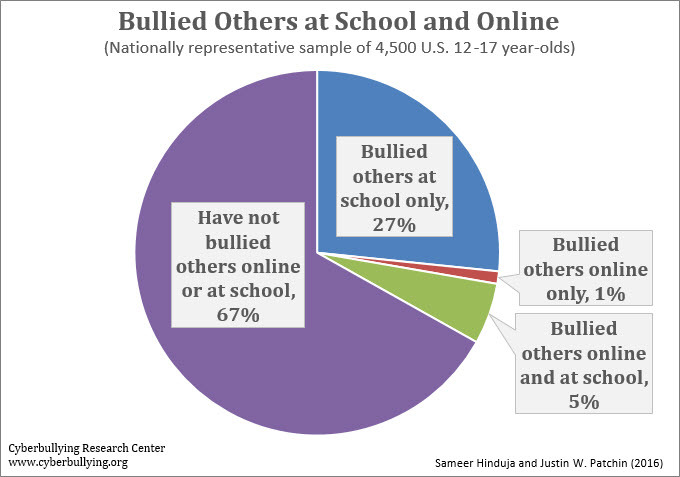 Similarly, 69% of the students who admitted to bullying others at school also bullied others online. So it is very likely that the causes and correlates of bullying influence behaviors and experiences across environments: what makes someone an attractive target at school makes them a good target online; what causes someone to be mean at school also causes them to be mean online. Our relatively large sample should enable us to utilize multivariate analyses to better understand the similarities and differences between those who experience–or participate in–different forms of bullying. This latest survey included a variety of questions that we’ve asked across many different questionnaires over the years (including: experience with different forms of harassment at school and online, sexting, and digital forms of teen dating violence). We also asked about school experiences and family relationships, as well as participation in minor deviance. Furthermore, the survey included information that we haven’t yet studied, including: “sextortion” (the practice of forcing someone (by threatening them) to send sexually explicit images), and self-cyberbullying. We’re really excited to dig into the data and will let you know on this site what we find. Keep checking back, or sign up for our newsletter to stay updated on our discoveries. For this study, we contracted with three different online survey research firms to distribute our questionnaire to a nationally-representative sample of middle and high school students. Each partner collected responses from approximately 1,500 12-17 year-olds which resulted in a final total sample size of 4,503. Overall we obtained a 13% response rate, which isn’t amazing, but is higher than most generic Internet surveys. With any imperfect social science study, caution should be used when interpreting the results. We can be reassured somewhat in the validity in the data, however, because the prevalence rates are in line with results from our previous school-based surveys. Moreover, the large sample size helps to diminish the potential negative effects of outliers. Finally, steps were taken to ensure valid responses within the survey instrument. For example, we asked the respondents to select a specific color among a list of choices and required them to report their age at two different points in the survey, in an effort to guard against computerized responses and thoughtless clicking through the survey. Wow! Cyberbullying is awful. Can one imagine a person posting negative pictures and statements about you. Pictures and Statements that cannot be erased, Pictures and Statements that can live on. It is terrible but with a bit of work the posts can be removed. Notifying the website and web distributor along with the cyber crime division of your local police department is a start. Also writing letters and publishing your request on the companies website is a good way to get some action. Where it&apos;s most difficult is with emails. But social media can be responsive when enough pressure is applied. I find it quite difficult to accept the fact that some people have become so vicious to others. I feel some students have forgotten that people should treat people the way they want to treated. Students should remember that what is put online does not disappear it is online and may resurface at anytime. Students, if you do not treat others the way you wish to be treated please began to do so.